International Business Times poll on major U.S. economic releases scheduled for release during the week of Feb. 11, 2019. 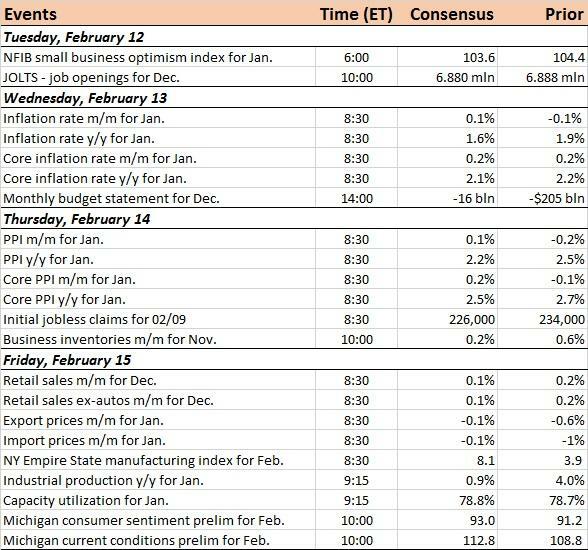 Markets will watch for inflation, producer price index, retail sales and industrial production data releases this week. Economists forecast the January monthly inflation rate to edge up to 0.1 percent from -0.1 percent in Dec., while the producer price index is expected to rise 0.1 percent from -0.2 percent in the prior period. December retail sales is seen rising 0.1 percent, versus 0.2 percent in Nov.